From 1915 to 1996, the school known at various times as Harding High School, Eber Baker Junior High School and, lastly, the Harding Freshman Building stood on West Church Street between Union and Orchard Street. According to a 1996 Marion Star article, the building was built to accommodate Marion’s growing population, which was spurred by a booming local economy. 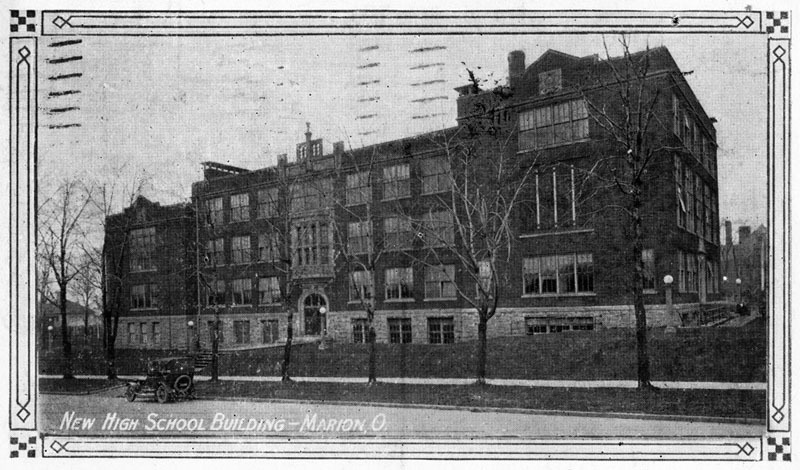 Thousands of students passed through the school’s doors during the nearly seven decades it was open, and even now many older Marionites recall the years they attended there with a great deal of fondness. A postcard featuring an early photo of the school, courtesy of Mike Crane. Anyone interested in looking at Mike’s nice collection of old photos, postcards and other assorted Marion miscellanea should check out his website. The odor of cherry flavored pipe tobacco was the most distinctive of the occurrences because it was the same kind used by a custodian who had worked there and since died. ‘I’d go down to turn the heat on in the boiler room and I could smell pipe tobacco just as plain as if somebody lit it. 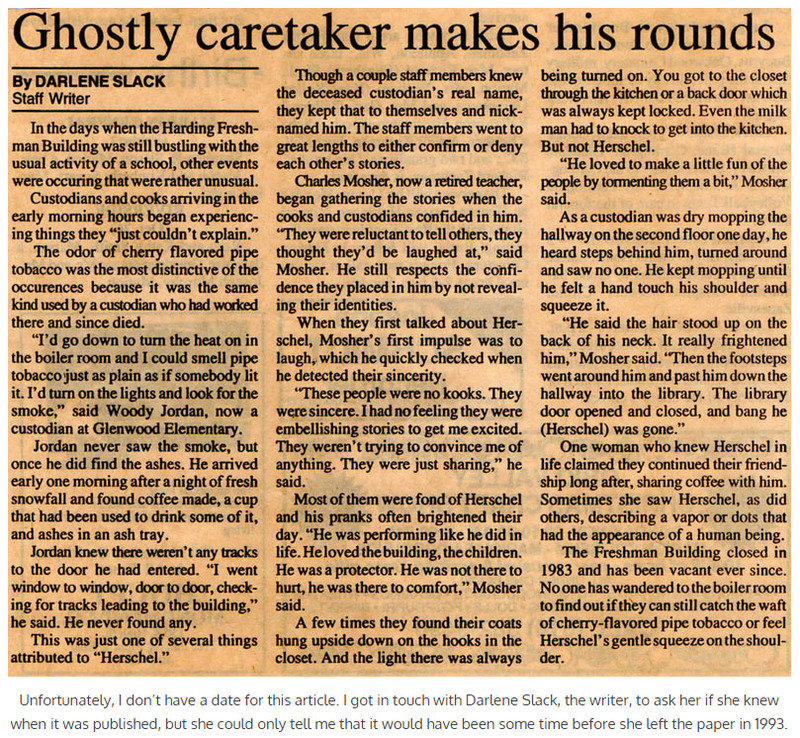 I’d turn on the lights and look for the smoke,’ said [custodian] Woody Jordan. Jordan never saw the smoke, but once he did find the ashes. He arrived early one morning after a night of fresh snowfall and found coffee made, a cup that had been used to drink some of it, and ashes in an ashtray. Jordan knew there weren’t any tracks to the door he had entered. ‘I went window to window, door to door, checking for tracks leading to the building,’ he said. He never found any. These people were no kooks. They were sincere. I had no feeling they were embellishing stories to get me excited. They weren’t trying to convince me of anything. They were just sharing. According to Mosher, Hershel was especially fond of pranks. Staff members would find their coats hanging upside down in the closet; the lights in locked rooms would mysteriously turn on. At times like these, Mosher said, the staff members were more amused than scared. As a custodian was dry mopping the hallway on the second floor one day, he heard steps behind him, turned around and saw no one. He kept mopping until he felt a hand touch his shoulder and squeeze it. [The custodian] said the hair stood up on the back of his neck. It really frightened him. Then the footsteps went around him and past him down the hallway into the library. The library door opened and closed, and…Hershel was gone. When Tri-Rivers opened in 1976, Harding High School’s vocational students began attending school there. This meant that there was now room at Harding for freshman. 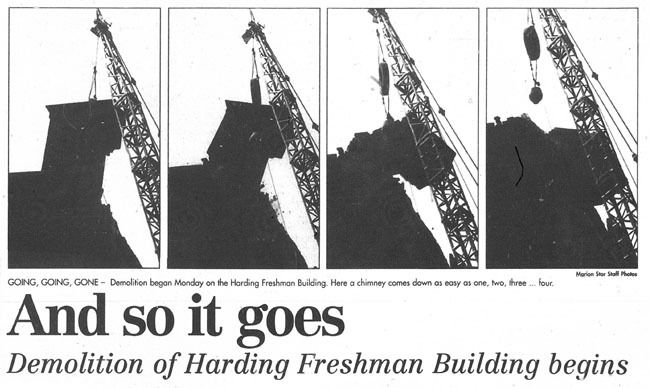 The Freshman Building, which by the early 80s was in a state of disrepair, closed in 1983 and sat empty for over a decade as the city tried to figure out what to do with it. Finally, unable to sell or develop the building, the city decided to demolish it. One can only wonder if Hershel was still haunting the long-silent school when the wrecking ball began crashing through its walls during the summer of 1996. I remember when this building was the Harding High School. I was part of the “Last Class” (1982-83). I heard stories but thought it was another joke passed on by former students. I heard stories about it too. I wish I could visit the place.